I took special notice of a recent item in the news. Most of what is reported in the news media––and we know that most of that is negative and depressing––has little relation to my personal affairs (unless you consider that what is reported generally reflects a diminution of the quality of life and social values that I hold dear). But the report of the maritime accident of the cruise ship Costa Concordia, an Italian ship of the mega class size that carries over 4000 passengers and 1000 crew, off the west coast of Italy on January 13 was of special interest to me since I had recently sailed in those waters albiet in a much smaller ship. Moreover, I also recently sailed into waters in the Andaman Sea in which some years ago I was sailing in a ship that very nearly capsized. You can read about the Costa Concordia in the contemporary news, but the main elements are that the captain. steered his ship to close to some submerged rocks near the coast and ripped a Titanic like gash in the ship’s bottom. The lights went out, the ship began to list to starboard, and the captain ordered the ship to head for shallower waters. Apparently there was much chaos aboard, some crew and Capt. 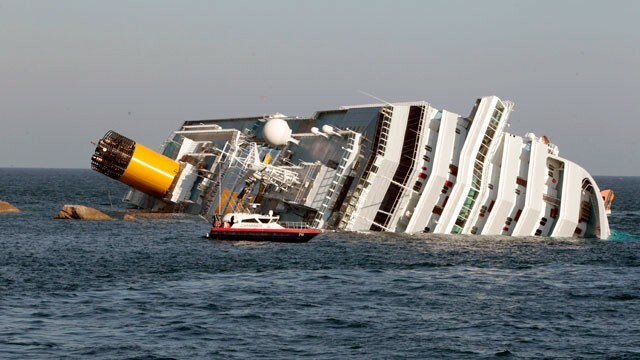 appear to have abandoned ship before all the passengers were off, and the ship now lies nearly flat on its star courtside just off the Italian town of San Giglio. Eleven passengers are dead and, at this writing, as many as 24 are remain missing. Comparisons are already being made to the Titanic, but the captain of the Costa ship, as lucky as he is stupid, was close enough to shallow water to be able to ditch the vessel, half-capsized as opposed to it sinking, in deep waters, as the Titanic did with 1,500 passengers. For those unfamiliar with the world of kitsch and Spanish pronunciation, Lladros (pronounced ‘YAAD-rose’) are ceramic figurines that manage to combine the extremes of high price and bad taste. They are proof at least that it is possible to sell almost anything to people with too much disposable income for whom shopping is as frequent a need as eating. Along with other useless dust collectors sold in cruise ships’ boutiques Lladros provide a shopping fix for those trapped between the tourist traps in each port. If you like those Sunday supplement offerings of pictures of dogs playing cards, and Princess Diana dolls that look like Barbi, you’ll just love Lladros. We were in the Andaman sea, bound for Singapore from Bombay. At the time I was in the movie theater, which rather than having theater-style seats, had lounge chairs and tables set upon, but unsecured to, risers facing the stage. I don’t recall the movie, although The Poseidon Adventure would have been appropriate, because the ship suddenly heeled over to starboard to a degree sufficient to pitch myself and several others out of our seats and onto the floor. I could hear some screams and yelps from the area just outside the theater where there were several bridge games in progress. It was sudden, frightening, and as I learned later, injurious to some galley workers who were scalded with hot soup, and a couple of passengers in the first dinner sitting who were thrown from their chairs in the dining room. It was later learned that our ship was crossing the path of a fleet of very small fishing vessels in the waters off the Andaman Islands. The small boats allegedly played a pelagic game of “chicken” with the cruise ship, which finally had to throw over the helm to avoid crushing one of them that ventured right under its bows. The ship righted itself after teetering a gut-wrenching moment over its center of gravity. I rushed out of the theater to see what happened. However, it was when I rounded the corner near the boutique that I saw the disaster, a tragedy that would tear the heart out of any collector with more money than discernment. An entire tall glass display case of Lladro ceramic figurines had toppled, shattering nearly every one of the figurines. Heads were broken off little sheep that had accompanied Little Bo Peep. Cutesy ceramic girls in ball gowns had been thrown from their swings and were missing arms and feet. All manner of cute kids and animals were horribly maimed. A little Dutch Boy had broken off his bicycle and fallen sodomously upon a headless ballerina. A woman stood nearby surveying the carnage. She looked over at me for some confirmation of the grief she was feeling for the fallen figurines. “I really fancied bringing home that lovely one with the mother Dalmatian and her pups,” she said sadly. From the expression on her face one would have thought she was viewing the killings fields of Cambodia. I feigned being too choked-up by the disaster to offer a reply, nodding a condolence. Inside I couldn’t have been more delighted than if a warehouse full of Yanni and Kenny G CDs had burned down. I wonder what might’ve happened had the ship that I was in had the same profile and size as the Costa Concordia. Like many of the mega ships of today the Concordia has several decks of cabins and suites with balconies and, above our decks with several pools, tracks, climbing walls and even waterslides. Moreover, these large ships still wish to be able to dock at ports rather than stand off and have to “tender in” thousands of passengers. Social architects have still tried to keep their draft as shallow as possible. Just how ungainly these megaships are is going to be proven by a rogue wave or the right of way challenge of a little fishing fleet. This is another reason why I think megaships are stupid. Not only do I not think that a passenger ship should be a floating fusion of a shopping mall and a theme park, I think the prospects of getting nearly 5000 people off a vessel that is listing and sinking––not to mention that it might be captained by a Greek or an Italian––are not very good. The contemporary mega cruise ship is by design intended to be a rather small self-contained town. The intention is that the ship itself be the destination so that there is no reason for the passenger to go and spend his or her money ashore. Hence they will get bigger and bigger in search of bigger and bigger profits. ** The only thing that might bring some sense into the equation is the fact that every floating city is a potential Atlantis.